Greeting Chinese tourists on the North Korean side are dozens of tour buses, collecting them for itineraries ranging from a day in neighbouring Sinijiu to a week visiting North Korea's main cities, including the capital Pyongyang. Dandong: Undeterred by escalating tensions between Pyongyang and Washington rattling nerves globally, a steady stream of tourists from China each morning passes through the immigration checkpoint at the border trading hub of Dandong. Greeting them on the North Korean side are dozens of tour buses, collecting them for itineraries ranging from a day in neighbouring Sinijiu to a week visiting North Korea's main cities, including the capital Pyongyang. "We're curious. 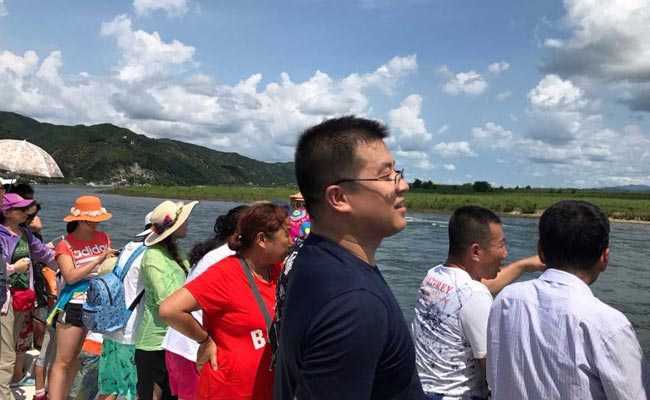 We want to see how they live," Xu Juan said on Thursday before crossing the Yalu River, which marks the border between the two countries. Xu was travelling with friends and family from Hangzhou, in eastern China. "I just want the sense of nostalgia, to see a country that is poor, like (China was) when I was young," said a man in his early 50s, from Jilin province, declining to give his name. Few expressed concern over the North's persistent missile tests in recent months, which led the United Nations Security Council on Saturday to impose tough new sanctions against Pyongyang. North Korea dismissed on Thursday warnings by US President Donald Trump that it would face "fire and fury" if it threatened the United States as a "load of nonsense", and outlined plans for a missile strike near the Pacific territory of Guam. But tour operators said their industry remains robust. Traffic, especially on lower-end group tours, has grown steadily to one of the world's most isolated states over the past few years, despite North Korea's persistent nuclear and missile tests, which have drawn ever-tightening UN sanctions. A flyer for the one-day tour to Sinijiu tout a trip to the city's central plaza, where you can pay respects to a bronze statue of North Korea's founding president Kim il-Sung, as well as visits to a cosmetics factory, a revolutionary history museum, art history museum and a cultural park. "You can feast on the North Korean speciality food by warm and hospitable North Koreans," it says. China's tourism authority has not published a breakdown of the total number of Chinese visitors to North Korea since 2012, when it said 237,000 made the trip. But the number travelling just from Dandong spiked to 580,000 in the second half of 2016 alone, according to the state-run China News Service. The report said 85 percent of Chinese tourist visits to North Korea originated from Dandong. That's still only a fraction of the 8 million Chinese who visited South Korea in 2016. Tourists can take ferries or charter speedboats down the Yalu for an up-close peek at North Korean villages and patrolling border guards. One tour operator targeting wealthier, more adventurous travellers said it was receiving more inquiries in recent weeks over whether it was safe to travel. "But those that inquire often already have their heart set on going," the operator, who declined to be named, told Reuters. "The idea of a bit of danger adds to the thrill and mystery of North Korea." Another tour guide, Teng Yi, said that while some may be deterred by tensions on the Korean peninsula, it was prompting others to get to North Korea while they still can. "There have been quite a few tourists in my groups who say they want to see North Korea in its reclusive state while they can," he said. "It won't be the same if the regime collapses."